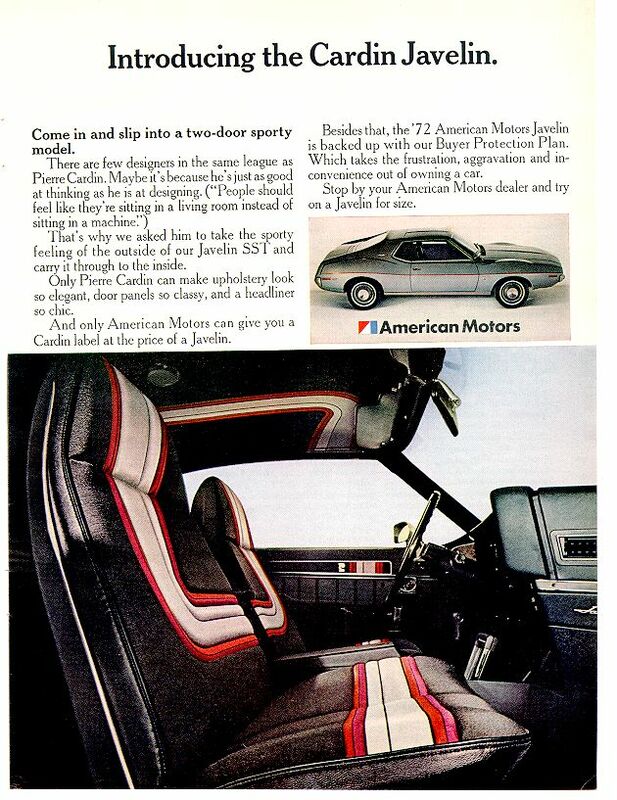 I would like to trade for a Pierre Cardin Javelin. 70s Disco Funk at its best! The only special Jav I am familiar with was the Mark Donahue special. A friend of mine had one back in high school. Classy car with some pep, but not a stump puller. I am recalling the Donahue special with a 360ci. Maybe they made different versions? It seems like the original Mark Donohue version is pretty hard to document; they seem to have been made by dealers, individuals, everybody! Nothing in the VIN to designate a Donohue version. It was probably just an appearance package of some sort. Seems like I even recall a Mark Donahue signature decal on the car. His car was a classy burgandy color with matching burgandy interior. Of course to be a true representation of the Trans Am car it would need to be the 304ci motor.